Please excuse my embarrassing collection of un-opened emails (that’s nothing- I actually have over 2000 un-opened when you look using a computer but I guess my phone couldn’t quite deal with that). What I want to draw your attention to isn’t the lack of signal (country life) or the low battery (anyone else start to sweat when it goes below 50%?) 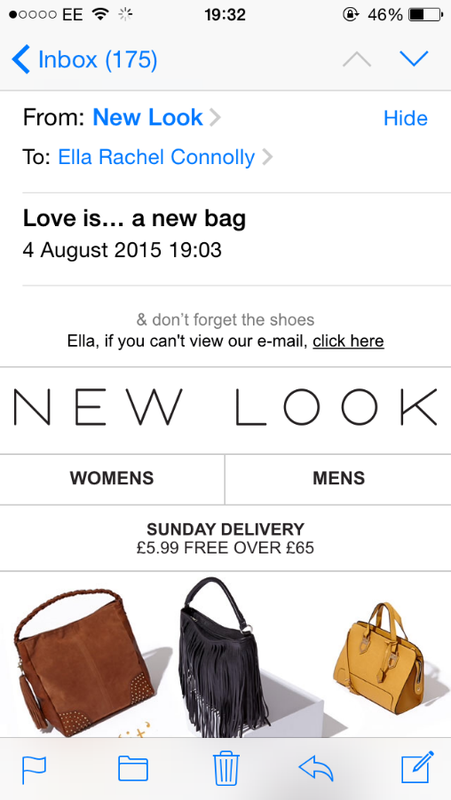 but the email I received from New Look the other day. Now before I get started I want to add a small disclaimer: I am in no way trying to discredit the retailer, I buy loads of my clothes there and only have positive things to say about them…well ok, maybe I have a tiny bone to pick, just this once. Go on, fill in the gap. A new pair of healed boots? A clutch bag that just goes so well with that outfit? 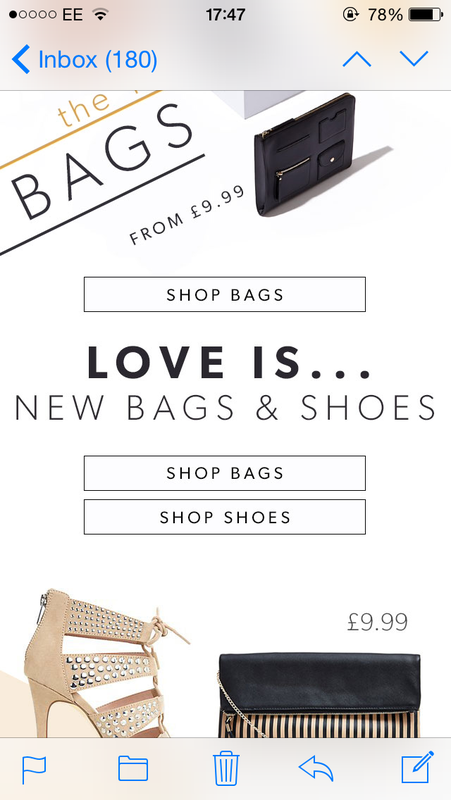 Now I’m not silly, I know New Look aren’t literally suggesting that accessories are in anyway a source of love (at least I hope they aren’t…) but when I read this email I was struck with how poignant that statement is- Love is…a thing, a product, an item. Now whilst it’s extremely difficult to define love, if I gave it my very best shot I certainly wouldn’t come up with ‘a bag’ or ‘shoes’. The Ancient Greeks had a go, they split up the concept of ‘love’ into various categories, Eros, Philia, Ludos, Pragma, Philautia and Agape… as an ex-classics student I have a real soft spot for the Greeks so I cant mention them without a teeny tiny encouragement to read more about their philosophy of love, which you can find here. Ok Ancient-Greek appreciation party over, I promise. But personally I truly believe love is a huge, wonderful, inexplicable process and after studying relationships in A2 Psychology this year, reviewing all the approaches, all the studies and opinions, I’ve come to the conclusion that…well, that it really takes the magic out of it when you try to understand it. Love isn’t supposed to be understood, or limited to an inanimate object. Love is wild, an expression of emotions that I don’t think we’re supposed to fully grasp. This is the type of love that the Greeks called ‘Agape’, love of humanity. This is the greatest type of love. It is sacrificial, boundless, relentless, miraculous and it is ours without limits. We don’t have to go out and purchase this kind of love. We don’t have to fill out a questionnaire and try to win this kind of love. There’s literally nothing we can do to obtain it. It is a gift and it is for all. This type of love is supposed to reflect the first. Our love that we’ve received from God should be mirrored by our treatment of others. Just like the first love (and unlike a pair of shoes or a bag) a relationship with another human can be mutually fulfilling because they can love you back. So of course we can like and appreciate things, I’m so grateful for all the things I own but let’s never be mistaken: things can never be a source of love, joy or peace. Real love changes you, aids you, grows you, encourages and motivates you. Real love is essential. Things are not. Now that’s cleared up I just want to reinforce, this is in no way a dig at New Look. It is just a few thoughts on a message they communicated that sparked a deep sense of ‘I have to write about that’ (If you’re a blogger let me know in the comments if I’m not alone in those ‘I just can’t not write about that’ moments!) After all New Look certainly isn’t the first shop to project materialistic ideals because well…they’re a shop. The notion that products are a source of love is worrying but certainly not a new idea but I do feel that it’s always important to remind people that they are loved. Not just a bit. Not even a lot. But an infinite amount. An amount we’ll probably never grasp this side of eternity. Let that sink in for a few moments. Hiya, thanks so much for reading and commenting. I’m glad you agree! Exactly- it’s not the particular store that’s the problem but the mentality itself. I just hope people feel loved from others and from God rather than searching for it in products and items. Have a lovely day! God’s love is so amazing! and we will never be able to fully understand it. Great post, really inspiring! I probably trump you on the un-opened or saved emails. Ugh! Thanks for visiting and being a sister in Christ! Ella, ‘you’ are the evidence, not only that a loving G-d exists, but His creations transcend our understanding of beauty.